Guaranteed #1 placements in Google is impossible yet it is something that at E-creation we are asked about on a regular basis. So we've put together a 5 minute master class on how to get the best from search engines and Google in particular. Information of achieving top placements in Google is a massively popular subject, you can find lots of more detailed information online, so we will keep our masterclass short, sweet and focused on how to use Blogger and Google's realtime indexing to maximise your position in Google. Google recently shifted to some some pretty amazing realtime indexing technology, largely driven by Twitter, Facebook and news websites where information changes rapidly and needed a way to be found at the appropriate time. As a result, the days of waiting weeks or months to see the results of modification of page content are gone BUT you need to use the correct technologies to achieve this. A key element is to use Blogger (which is owned by Google, surprise, surprise) as your CMS to achieve top search engine placements with continual improvement and adjustment of content. The www.e-creation.eu site integrates Blogger discreetly in its news and blog section - and our approach enables us to place new content into Google in as little as 3 MINUTES(!) of posting content. In fact, for our Google SEO masterclass, I will start a timer and post an update on how long it takes for this post to be indexed by Google (under the term 'blogger and realtime google masterclass' - 9 minutes and counting so far ... isn't technology fun - RESULT - 11 minutes and achieving number 5 position for 'Google Masterclass' as well). 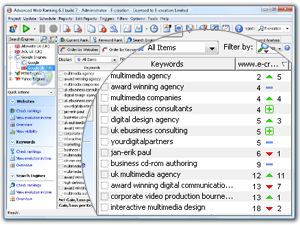 So how does this rapid indexing of content help your business and website? People tend to be driven by fashion and peer behaviour, so if a particular business topic or subject suddenly has masses of traffic, it makes sense for a business to utilise the 'spike' for business purposes. People are hungry for information on that topic and if it resolves a technical, business or marketing issue, then your timely advice is massively valuable. For example, as part of a online marketing & Google optimisation campaign for an online support client, E-creation keeps an eye on new bugs & IT issues released by Microsoft, as well as trawling through IT discussion forums, looking for popular subjects. If a known bug is being discussed or problems due to updates to operating systems or server platforms, together with the client, E-creation writes a micro blog that is posted via a Blogger CMS we built. As the Blogger element is integrated seamlessly into the website, relevant traffic flows to the website within 5 minutes of posting the information, helping to position the company at the forefront of expert advice for an topical subjects (and creating key revenue for the client). The term 'to Google it' is a reflection of the ease with which people can find information online using Google and therefore, if you know that a particular subject is popular, the window of opportunity to leverage that moment may be short. Often it's best to be the first rather than the 'best' (and we are not just talking about where you rank in search engine, but rather how early you make 'first contact' from a brand perspective). So back to topic, using Blogger to achieve #1 positions in Google. With Google's realtime indexing of content, once you know what content is topical, you can post, repost and refine your postings infinitely with realtime feedback on each iteration. (I describe website content pages as postings, because the technology behind the content pages is blogging technology - but what visitors experience are standard content pages within a website). This ability to continually refine the postings and see resulting search engine placements means you have the power to tune the posting (web page) content in realtime. E-creation will adjust this post itself, looking at the type of traffic that is generated, assessing the type of business that can be built from that traffic and of course, establishing the value of the information we are providing for free online. Of course, it is absolutely essential that you have something useful and topical to say. Content is still the key pull for websites but using technologies such as Blogger and realtime Google indexing are key to leveraging that content. The ability to apply a design style to a Blogger feed, as well as the ability to use your unique URL (e.g. 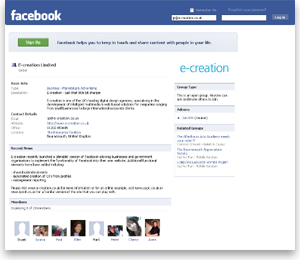 news.e-creation.eu) ensures brand integrity.